The conifers, division Pinophyta, also known as division Coniferophyta or Coniferae, are one of 12 extant division-level taxa within the Kingdom Plantae (Viridiplantae) and 10 within the extant land plants. 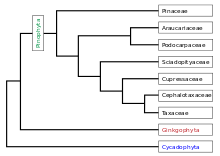 Pinophyta contains a single class, Pinopsida. 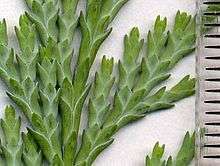 Pinophytes are gymnosperms, cone-bearing seed plants with vascular tissue. All extant conifers are woody plants with secondary growth. The great majority are trees, though a few are shrubs. 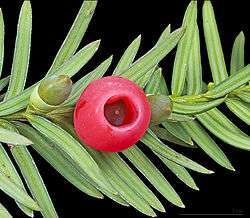 Examples include cedars, Douglas-firs, cypresses, firs, junipers, kauri, larches, pines, hemlocks, redwoods, spruces, and yews. As of 1998, the division was estimated to contain eight families, 68 genera, and 629 living species. Although the total number of species is relatively small, conifers have immense ecological importance. They are the dominant plants over huge areas of land, most notably the taiga of the northern hemisphere, but also in similar cool climates in mountains further south. Boreal conifers have many wintertime adaptations. The narrow conical shape of northern conifers, and their downward-drooping limbs, help them shed snow. Many of them seasonally alter their biochemistry to make them more resistant to freezing. While tropical rainforests have more biodiversity and turnover, the immense conifer forests of the world represent the largest terrestrial carbon sink. They are also of great economic value for timber and paper production; the wood of conifers is known as softwood. The earliest conifers in the fossil record date to the late Carboniferous (Pennsylvanian) period (about 300 million years ago), possibly arising from Cordaites, a seed-bearing plant with cone-like fertile structures. This plant resembled the modern Araucaria. Pinophyta, Cycadophyta, and Ginkgophyta all developed at this time. An important adaptation of these gymnosperms was allowing plants to live without being so dependent on water. Other adaptations are pollen (so fertilization can occur without water) and the seed, which lets the embryo be transported and developed elsewhere. Conifers appear to be one of the taxa that benefited from the Permian–Triassic extinction event, and were the dominant land plants of the Mesozoic era. They were overtaken by the flowering plants, which first appeared in the Cretaceous, and became dominant in the Cenozoic era. They were the main food of herbivorous dinosaurs, and their resins and poisons would have given protection against herbivores. Reproductive features of modern conifers had evolved by the end of the Mesozoic era. All living conifers are woody plants, and most are trees, the majority having monopodial growth form (a single, straight trunk with side branches) with strong apical dominance. Many conifers have distinctly scented resin, secreted to protect the tree against insect infestation and fungal infection of wounds. Fossilized resin hardens into amber. The size of mature conifers varies from less than one meter, to over 100 meters. The world's tallest, thickest, and oldest living trees are all conifers. The tallest is a Coast Redwood (Sequoia sempervirens), with a height of 115.55 meters (although one Victorian mountain ash, Eucalyptus regnans, allegedly grew to a height of 140 meters, although the exact dimensions were not confirmed). The thickest, or tree with the greatest trunk diameter, is a Montezuma Cypress (Taxodium mucronatum), 11.42 meters in diameter. The smallest is the pygmy pine (Lepidothamnus laxifolius) of New Zealand, which is seldom taller than 30 cm when mature. The oldest is a Great Basin Bristlecone Pine (Pinus longaeva), 4,700 years old. Conflicting sources claim that the largest tree by three-dimensional volume is either: a Giant Sequoia (Sequoiadendron giganteum), with a volume 1486.9 cubic meters or a Ficus benghalensis named Thimmamma Marrimanu with volume unspecified. 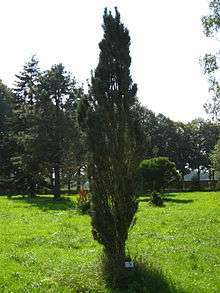 Since most conifers are evergreens, the leaves of many conifers are long, thin and have a needle-like appearance, but others, including most of the Cupressaceae and some of the Podocarpaceae, have flat, triangular scale-like leaves. Some, notably Agathis in Araucariaceae and Nageia in Podocarpaceae, have broad, flat strap-shaped leaves. Others such as Araucaria columnaris have leaves that are awl-shaped. In the majority of conifers, the leaves are arranged spirally, exceptions being most of Cupressaceae and one genus in Podocarpaceae, where they are arranged in decussate opposite pairs or whorls of 3 (-4). In many species with spirally arranged leaves, such as Abies grandis (pictured), the leaf bases are twisted to present the leaves in a very flat plane for maximum light capture. Leaf size varies from 2 mm in many scale-leaved species, up to 400 mm long in the needles of some pines (e.g. Apache Pine Pinus engelmannii). The stomata are in lines or patches on the leaves, and can be closed when it is very dry or cold. The leaves are often dark green in colour, which may help absorb a maximum of energy from weak sunshine at high latitudes or under forest canopy shade. Conifers from hotter areas with high sunlight levels (e.g. Turkish Pine Pinus brutia) often have yellower-green leaves, while others (e.g. Blue Spruce Picea pungens) have a very strong glaucous wax bloom to reflect ultraviolet light. In the great majority of genera the leaves are evergreen, usually remaining on the plant for several (2-40) years before falling, but five genera (Larix, Pseudolarix, Glyptostrobus, Metasequoia and Taxodium) are deciduous, shedding the leaves in autumn and leafless through the winter. The seedlings of many conifers, including most of the Cupressaceae, and Pinus in Pinaceae, have a distinct juvenile foliage period where the leaves are different, often markedly so, from the typical adult leaves. The male cones have structures called microsporangia that produce yellowish pollen through meiosis. Pollen is released and carried by the wind to female cones. Pollen grains from living pinophyte species produce pollen tubes, much like those of angiosperms. 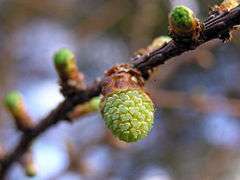 The gymnosperm male gametophytes (pollen grains) are carried by wind to a female cone and are drawn into a tiny opening on the ovule called the micropyle. It is within the ovule that pollen-germination occurs. From here, a pollen tube seeks out the female gametophyte and if successful, fertilization occurs. The resulting zygote develops into an embryo, which along with its surrounding integument, becomes a seed. Eventually the seed may fall to the ground and, if conditions permit, grows into a new plant. Fraser recorded the development of a single white spruce tree from 1926 to 1961. Apical growth of the stem was slow from 1926 through 1936 when the tree was competing with herbs and shrubs and probably shaded by larger trees. Lateral branches began to show reduced growth and some were no longer in evidence on the 36-year-old tree. Apical growth totalling about 340 m, 370 m, 420 m, 450 m, 500 m, 600 m, and 600 m was made by the tree in the years 1955 through 1961, respectively. The total number of needles of all ages present on the 36-year-old tree in 1961 was 5.25 million weighing 14.25 kg. In 1961, needles as old as 13 years remained on the tree.The ash weight of needles increased progressively with age from about 4% in first-year needles in 1961 to about 8% in needles 10 years old. In discussing the data obtained from the one 11 m tall white spruce, Fraser et al. (1964) speculated that if the photosynthate used in making apical growth in 1961 was manufactured the previous year, then the 4 million needles that were produced up to 1960 manufactured food for about 600,000 mm of apical growth or 730 g dry weight, over 12 million mm3 of wood for the 1961 annual ring, plus 1 million new needles, in addition to new tissue in branches, bark, and roots in 1960. Added to this would be the photosynthate to produce energy to sustain respiration over this period, an mount estimated to be about 10% of the total annual photosynthate production of a young healthy tree. On this basis, one needle produced food for about 0.19 mg dry weight of apical growth, 3 mm3 wood, one-quarter of a new needle, plus an unknown amount of branch wood, bark and roots. A number of conifers originally introduced for forestry have become invasive species in parts of New Zealand, including Radiata pine (Pinus radiata), Lodgepole pine (P. contorta), Douglas fir (Pseudotsuga mensiezii) and European larch (Larix decidua). In parts of South Africa, Pinus pinaster, P. patula and P. radiata have been declared invasive species. These wilding conifers are a serious environmental issue causing problems for pastoral farming and for conservation. Conifers – notably Abies (fir), Cedrus, Chamaecyparis lawsoniana (Lawson's cypress), Cupressus (cypress), juniper, Picea (spruce), Pinus (pine), Taxus (yew), Thuja - have been the subject of selection for ornamental purposes (for more information see the silviculture page). Plants with unusual growth habits, sizes, and colours are propagated and planted in parks and gardens throughout the world. The general short-term effect of nitrogen fertilization on coniferous seedlings is to stimulate shoot growth more so than root growth (Armson and Carman 1961). Over a longer period, root growth is also stimulated. Many nursery managers were long reluctant to apply nitrogenous fertilizers late in the growing season, for fear of increased danger of frost damage to succulent tissues. A very interesting presentation at the North American Forest Tree Nursery Soils Workshop at Syracuse in 1980 provided strong contrary evidence: Bob Eastman, President of the Western Maine Forest Nursery Co. stated that for 15 years he has been successful in avoiding winter “burn” to Norway spruce and white spruce in his nursery operation by fertilizing with 50-80 lb/ac (56–90 kg/ha) nitrogen in September, whereas previously winter burn had been experienced annually, often severely. Eastman also stated that the overwintering storage capacity of stock thus treated was much improved (Eastman 1980). Of course, the concentrations of nutrient in plant tissues depend on many factors, including growing conditions. Interpretation of concentrations determined by analysis is easy only when a nutrient occurs in excessively low or occasionally excessively high concentration. Values are influenced by environmental factors and interactions among the 16 nutrient elements known to be essential to plants, 13 of which are obtained from the soil, including nitrogen, phosphorus, potassium, calcium, magnesium, and sulfur, all used in relatively large amounts (Buckman and Brady 1969). Nutrient concentrations in conifers also vary with season, age and kind of tissue sampled, and analytical technique. The ranges of concentrations occurring in well-grown plants provide a useful guide by which to assess the adequacy of particular nutrients, and the ratios among the major nutrients are helpful guides to nutritional imbalances. The softwood derived from conifers are of huge economic value, primarily for timber, paper and plastic (derived from chemically treated wood pulp) production They also provide about 45% of the world’s annual lumber production. Conifers also serve as a food source such as pine nuts. Juniper berries are also used to flavor gin. 1 2 3 Henry, R.J.(2005) Plant Diversity and evolution. London: CABI. ↑ Christenhusz, M.J.M., Reveal, J., Farjon, A., Gardner, M.F., Mill, R.R. & Chase, M.W. (2011) A new classification and linear sequence of extant gymnosperms. Phytotaxa 19: 55–70. ↑ Enright, Neal J. and Robert S. Hill. 1990. Ecology of the southern conifers. Washington, DC: Smithsonian. 342pp. ↑ Wassilieff, Maggy. "Conifers". Te Ara – the Encyclopedia of New Zealand updated 1-Mar-09. ↑ Dallimore, William, Albert Bruce Jackson, and S.G. Harrison. 1967. A handbook of Coniferae and Ginkgoaceae, 4th ed. New York: St. Martin's Press. xix, 729 p.
↑ Peter Matthews; Michelle Dunkley McCarthy; Mark (CON) Young (October 1993). The Guinness Book of Records 1994. Facts on File. ISBN 978-0-8160-2645-6. Retrieved 5 June 2012. 1 2 3 Singh, H. 1978. Embryology of gymnosperms. Berlin, Gebruder Borntraeger. 1 2 3 Fraser, D.A. ; Belanger, L.; McGuire, D.; Zdrazil, Z. 1964. Total growth of the aerial parts of a white spruce tree at Chalk River, Ontario, Canada. Can. J. Bot. 42:159–179. 1 2 "South Island wilding conifer strategy". Department of Conservation (New Zealand). 2001. Retrieved 2009-04-19. ↑ Farjon, Aljos (2010). A handbook of the world's conifers. Brill Academic Publishers. ISBN 9004177183. ↑ Durzan, D.J. ; Steward, F.C. 1967. The nitrogen metabolism of Picea glauca (Moench) Voss and Pinus banksiana Lamb. as influenced by mineral nutrition. Can. J. Bot. 45:695–710. ↑ McFee, W.W.; Stone, E.L. 1968. Ammonium and nitrate as nitrogen sources for Pinus radiata and Picea glauca. Soil Sci. Soc. Amer. Proc. 32(6):879–884. ↑ Swan, H.S.D. 1960. The mineral nutrition of Canadian pulpwood species. 1. The influence of nitrogen, phosphorus, potassium and magnesium deficiencies on the growth and development of white spruce, black spruce, jack pine and western hemlock seedlings grown in a controlled environment. Pulp Paper Res. Instit. Can., Montreal QC, Woodlands Res. Index No. 116, Tech. Rep. 168. 66 p.
↑ Armson, K.A. ; Carman, R.D. 1961. Forest tree nursery soil management. Ont. Dep. Lands & Forests, Timber Branch, Ottawa ON. 74 p.
↑ Eastman, B. 1980. The Western Maine Forest Nursery Company. pp. 291-295 In Proc. of the North American Forest Tree Nursery Soils Workshop, July 28-August 1, 1980, Syracuse, New York. Environment Canada, Canadian Forestry Service, USDA For. Serv. ↑ Buckman, H.O. ; Brady, N.C. 1969. The Nature and Properties of Soils, 7th ed. Macmillan NY. 653 p.